Liquefied gases are used throughout various industrial processes. Nitrogen and other gasses are often provided in liquefied form for cryogenic purposes. Liquefied carbon dioxide is used for the production of various chemicals, manufacture of fertilizers, plastics and rubber, use in fire extinguisher systems, carbonation of soft drinks, and a very wide variety of other applications. The semiconductor industry uses a number of other liquefied gases for the process of wafers and other applications. The welding industry is another large consumer of liquefied gases. Of course it is important to monitor the amount of the gas that is in the tank. This is the case while the tank is filled, to make sure that it is not overfilled, which can be quite hazardous. It is also necessary to monitor the usage, both to make sure that it is being used at the correct rate, and to avoid running out of the material during a process batch. The most standard method to monitor gas is to measure the pressure in the tank. There are a wide variety of pressure sensors that may be used for this purpose. But this is a useless method in the case of a liquefied gas, because the pressure will always remain constant until just before the last of the gas has been used. As the liquid ‰ÛÏboils off‰Û it will maintain a steady pressure in the tank. Only when the last of the liquid has become a gas will the pressure drop. At this point, the gas is almost entirely finished. It is very easy to determine how much material is in the tank by weighing it. As long as the weight of the empty tank is known, the weight of the contents may be easily determined. Weighing is appropriate for both filling and dispensing. There are a number of characteristics of gas cylinder scales that make them easier to use, more rugged and more accurate. These are typically found in high quality scales such as the 620G Series from Arlyn Scales. The most important quality is the ruggedness of the load sensor. 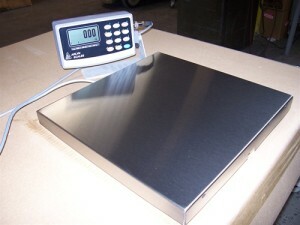 These scales can be subjected to very high forces when the cylinders are loaded and unloaded from the scale. Standard load cells can easily be destroyed during this process. Special load cells should be used in the gas cylinder scale that will prevent this damage. They should be constructed from a stainless steel alloy, instead of the standard plated steel. This will provide a higher modulus of elasticity which will protect from shock loading. Because the scale will experience extremely high side loads as the cylinder is tilted on and off, the load cell should also be very wide. This will prevent the load cell from being damaged from twisting forces. Furthermore, the load cell should have a very low profile for easy loading and unloading. The scale itself should be constructed in a manner that results in a very low height. Of course, as previously noted, it is necessary that the load cell have a low profile. The body of the scale should have a pocket machined to accommodate the load cell. Heights of about 1‰Û can be achieved with this type of construction. A variety of outputs can be useful for monitoring the cylinders. One industrial standard is a 4 to 20 ma output signal. This is often connected to other process or recording equipment. Alternatively, a digital RS-232 signal, or a USB interface may also be used. Programmable setpoints can be used to provide controls and alarms for a filling operation. When a target weight is reached, a signal may be sent to a valve to shut it off. The signal may also be used to turn on buzzers or lights to notify the filling operator. Similarly, setpoints may be programmed for notification that the tank contents is getting low, or has reached its empty state. It is also possible to connect the scale to the Internet to monitor it from any location. The scale can report its weight at selected intervals. Or a central location can query the scale when desired. This weight data may be stored in a database format, and recalled for later usage analysis. Or the data may be downloaded into a spreadsheet.